Nadine and I needed to travel to Fresno to get some things taken care of, and I decided to wear this outfit. It takes two hours to get to Fresno so I wanted to be comfortable. I really like these items, but I usually do not wear shorts this short out and about in the world. I usually wear them to the lake over my bikini or to the local market. Yet I decided I needed to just go for it. This top has a draped neck line, and I love it! I have several other shirts, long and short sleeve, and tanks, that have draping. It seems to me that the draping up by the neck draws the eye to my neck area, which is good because I like my neck and want to show it off. (Kind of an odd body part to really like, but my neck is long and in my opinion, makes me look regal.) The color is a lighter teal color, which is definitely in my color palette. Blue is one of favorite colors to wear, in almost any shade. The shorts are a light denim with white embroidered flower that have a crystal as the center of the flower. (Sorry there is no close up-still learning what to take pictures of for my posts here.) They have a little bit of jean fringe at the bottom, which many years ago I refused to wear. I had the idea that the fringe would tickle and bother me. It doesn't; in fact, I think it adds something to the shorts. (Interesting what ideas we have in our heads that are really not true, just made up fears by our magnificent brains.) Although I was apprehensive about wearing what I consider short shorts, the day went great, and I did not get any weird comments or looks at my shorts, (No pitch forks or torches either. Hee-hee.) I was glad to be able to show off my legs, and not for the usual reasons most people like to show their legs. It has been almost 2 years since I shattered my left tibia, and now I am almost back to 100% usage and mobility. Also, the leg is all me since recently having the hardware taken out. I am very proud of the scar because it reminds me how hard I have worked to get where I am today. :) In my opinion, scars are our proof we lived through something hard, and you all should be proud of your scars, too. 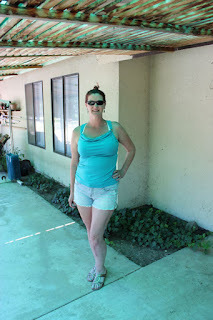 I wore a pair of tri-metallic colored wedge sandals for our outing. They are comfortable and cute with a small heel, which was great because I had not worn a lot of heels since the surgery. A small wedge is so great for walking in or wearing all day at work; they are feminine yet functional, a big plus for those of us who are on our feet most of the work day, or for any time you're going to be out and about for the day. Love how you are, but never stop trying to better yourself! Hugs!!!!!!!!!! That's a great outfit on you! Light, cute, casual, and I love the colors. Good to read that your leg is doing so well, too! I also agree with your closing line. Thank you tori the compliment! I like this outfit, too, obviously. I appreciate your well wishes about my leg. It is only getting stronger, especially after our trip back East. Yeah, I, like you, think I should try to love me now but never stop trying to be better.